Bikers looking DOWN at the clouds below! Coast all the way to the ocean ... 26 miles! Reserve your space today for the sunrise or day tour! Experience the longest downhill bike tour in the world, and take in the gorgeous vistas of Maui all around you. 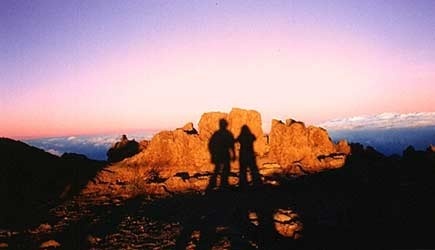 Start your adventure at the 10,000 foot summit of Haleakala National Park and enjoy the panoramic views into the crater. At an elevation of 6500 feet, you will begin the actual bike ride down and this is located just outside the park boundary. Many other companies have decreased their tour by several miles at the conclusion of the ride, the tours offered on this page cover the complete 26 miles to the ocean in Paia. We offer a Summit Sunrise tour with a middle of the night pick up or a Sunrise from 6500 Feet Tour that picks up about 90 minutes later. Our most popular tour is the summit sunrise adventure, and space is very limited! A van picks you up from your hotel or cruise ship, and take you up to the summit of Haleakala. First you will be taken to the baseyard, and be fitted with gear and given coffee, tea, hot chocolate, juice and granola bars. Then the van will drive you up to the 10,000 foot summit of Haleakala National Park. The certified guides provide captivating information about geology, history and ecology of the area. Witnessing the sun rise from the crater’s rim is a moment of a lifetime. After a safety briefing and a walk of the park, your journey proceeds to just outside the park boundary to the 6500 foot level and you will be fitted to your bicycle before descending on your 26 mile ride down the slopes of Haleakala. Pause at switchbacks to photograph upcountry Kula. At the cowboy town of Makawao, you will stop for breakfast where food is available for purchase. Then continue your descent on the lower slopes of Haleakala through the pineapple and sugar cane fields, and Pacific Ocean at Paia Beach Park. The Sunrise Bike Tour covers the whole distance, all the way to the ocean unlike other tours that cut their tour short. Tour includes: Middle of the night snack of hot and cold beverages and granola bars. Breakfast is available for purchase at Makawao. Gear Provided: Windbreaker jacket, helmet and Volcano Chrome Cruiser Bikes. Reservations: Due to national park restrictions which recently went into effect, capacity for this tour has been severely limited. We recommend reservations be made at least a month in advance of your date, especially during holiday periods and summer months. Due to limited availability, non-biking van riders are the same price as bikers for the sunrise tour. Note: The tour group will decide on the day whether to have a breakfast stop on the way down or in Paia. Cancellation Policy: Cancellations / changes must be made a minimum of 5 full days (120 hours) prior to the start of the Summit Sunrise Tour. On this tour your pickup time will be about 90 minutes later than the “Summit Sunrise Tour” and instead of going all the way to the summit, your group will watch the pre-dawn colors from the 6500 foot elevation, just outside the Haleakala National Park entrance. This is also the point where your biking will begin. While this option is much less expensive than the tour that goes all the way to the summit, the ACTUAL BIKING on this tour is EXACTLY THE SAME! You will ride 26 miles down the slopes of Haleakala, including the famous series of switchbacks and upcountry Kula. You will ride through Makawao town and through the sugar cane and pineapple fields on the lower slopes of Haleakala… continuing on to the Pacific Ocean and ending at Paia beach park. At Makawao, you will stop for breakfast, and food is available for purchase. Return to your resort or cruise ship will be between 11am and noon. Tour includes: Snack of hot and cold beverages and granola bars. Breakfast is available for purchase at Makawao. Do you prefer to get more sleep on your vacation? Then check out our day tour option! It includes all the same features of the Predawn at 6500 Feet tour only without the middle of the night pickup. The Day Bike Tour has extremely limited seating so book early! Haleakala National Park is NOT included on this tour. The tour begins with hotel or cruise ship pickup, and you will be taken to Mountain Riders Maui bike tour base. Watch the Maui bike industry’s only safety video, and enjoy complimentary coffee, juice, and snacks. After this stop, you begin your guided van tour of Maui to Haleakala. Certified tour guides explain the a history of Haleakala, its geology, and an explanation of rare plants and animals only found on Maui. 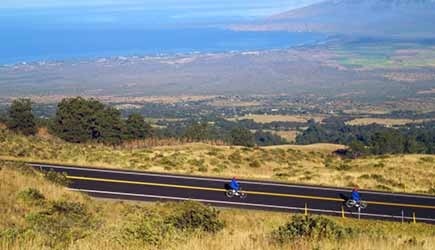 Biking begins at the 6500 foot level just outside the park boundary where you will be expertly fitted to your bicycle and begin your 26 mile ride down the slopes of Haleakala, which includes the famous series of switchbacks and upcountry Kula. Most companies have cut miles off the bottom of the ride, but this tour covers the entire distance all the way to the ocean. Ride through Makawao town and through the sugar cane and pineapple fields on the lower slopes of Haleakala. Continue to cruise down to the Pacific Ocean where you will end at Paia beach park. You will stop for lunch at Makawao or Paia, and food is available for purchase. Tour includes: Snack of hot and cold beverages and granola bars. Lunch is available for purchase. Note: The tour group will decide on the day whether to have a lunch stop on the way down or in Paia. If you’re interested in adding more to your Haleakala adventure, check out the Sunrise Bike and Zip Tour! Watch the sunrise, and then cruise down 21 switchbacks to the Zipline Course. Schedule: Daily for Summit Sunrise. Tuesday through Saturday for Predawn and Day tours. Bike tours are not available during certain Hawaiian ceremonial date s including 6/21/2018, 7/18/2018, 10/3/2018, 12/21/2018 and 12/31/2018. Reservations: Book early – seats are very limited due to National Park restrictions. Gear Provided: Columbia Sportswear windbreaker, gloves, helmet, and state of the art volcano chrome cruiser bike with heavy-duty brakes. Restrictions: Minimum biking age is 12 …due to high elevation no pregnant women are allowed on this tour, either as a biker or a van rider. Maximum weight approx. 280lbs. Minimum height 4′ 10″. What to Bring & Wear: Layers of clothing…the summit is cold and as you descend it will get warm. Close toed shoes are mandatory. Cancellation Policy: Cancellations / changes must be made a minimum of 5 full days (120 hours) prior to the start of the Summit Sunrise Tour and 3 full days (72 hours) prior to the start of the Predawn at 6500 Foot Tour and Day Bike Tour. If tour gets cancelled due to severe weather you will receive a full refund or the option to reschedule. Note: Approximately 80% of Maui bike tours will be able to view the sunrise at Haleakala, however the crew cannot control the weather. We are sorry, but there is no refund for poor visibility of the sunrise. The Summit Sunrise Bike Tour is the only tour available for cruise ship passengers. NCL cruise ship passengers are able this tour on their second day in port in Kahului. The pickup point is a 5 block walk from the cruise ship dock. This tour can also work for other cruise ship passengers who have a two-day stay in Lahaina on the morning of their second day. The most helpful piece of advice for doing the sunrise bicycle tour is to make your reservation in advance for the first full day that you are in Hawaii (when the time change is working in your favor). The logic is simple. Due to the time change, you will find yourself waking up at 4am on the first day that you are here anyway. Since you are already going to wake up early that day, you might as well get up a little bit earlier and start our your vacation by doing something fun and exciting! Remember, it gets cold at 6,000-10,000 feet, especially in the winter months. Yes, the bike companies provide a wind breaker and gloves, but you will still want some layers underneath, especially for the summit sunrise tour. As your group heads down the mountain, it gets warmer. You will pause along the way for photos and “strip stops.” Everything you don’t need anymore goes in the van. One other advantage of Mountain Riders; their breakfast stop during the sunrise tour is in the middle of the ride, right along the tour route. Some companies wait until the very end of the ride (which is pretty late for breakfast) and one company loads you into the van part way through the ride and drives you several miles out of the way to a breakfast spot. A word about the unguided option … personally I much prefer the guided tour because of the extra measure of safety it provides. The guide sets a safe, comfortable pace for the group (about 12-15 miles per hour on average) and the van follows your group back down the mountain. This “chase vehicle” prevents cars from passing you at times when it is not safe. You don’t have to worry about looking over your shoulder to see what’s coming from behind you. If there are cars backed up behind the chase vehicle, the driver talks to the guide on his walkie-talkie and they arrange for a place to pull over to the side and let the traffic pass. Several of our staff have lived near the bike tour route and we can tell you that the unguided people make us cringe … we have decided the risk of injury is too great to offer this option to our clients. While 26 miles sounds like a long ride, it really isn’t when you are coasting downhill almost the entire way. There is literally only 400 yards of peddling spread out throughout the entire ride! I am often asked if you can get off the bike if you get tired. It rarely becomes an issue, but if at any time you don’t feel like riding anymore you can pull over and get in the van (on the guided tour of course). You can ride in the van for a while, and even get back out on the bike at a future stopping point if you like. Many people ask about the brakes. They are hand-operated brakes but they aren’t the kind of brakes you see on typical mountain bikes or road bikes. They are heavy duty drum brakes built into the hub of the front and back wheel, not a pad that grabs the side of the wheel frame. It’s the same kind of brake as the foot pedal brakes on the old style bikes. In this case they are operated by hand controls so you can brake the front and back brakes evenly. This style brake STAYS DRY and isn’t compromised by wet roads like the pad brakes found on the kind of bikes that most people have in their garage. The seats are well padded, and you ride in an upright position, not hunched over like a 21 speed racing bike. The road that you bike is completely paved, and while there are lots of 180 degree turns and it is 5-6% downhill grade, it is not inherently dangerous AS LONG AS YOU KNOW HOW TO RIDE A BIKE!!! I can’t emphasize this enough … while there are occasionally accidents on this ride (and on rare occasions those accidents have been fatal), they are almost always the result of someone who lacked confidence (and/or ability) at riding a bicycle. If you are riding a bike and you fall, or you run into a guardrail, you ARE going to get hurt … whether you are doing it on a mountain on Maui or on flat ground in Kansas! My best advice is this … IF YOU HAVE NOT RIDDEN A BICYCLE IN 40 YEARS, THE TOP OF A VOLCANO IS NOT THE BEST PLACE TO TRY TO REMEMBER HOW TO RIDE A BIKE!!! Borrow a bicycle from someone and ride around your neighborhood before you come to Hawaii. A few hours of peddling will refresh your mind about steering and braking and give you the confidence you need to do just fine on this ride. If you are uncomfortable riding a bike in your neighborhood, then you should sit out this activity or just go along in the van for the ride. All-in-all, this is one of Maui’s must-do activities … don’t miss it! With Mountain Riders, this is THE LONGEST downhill bike tour available anywhere in the world.